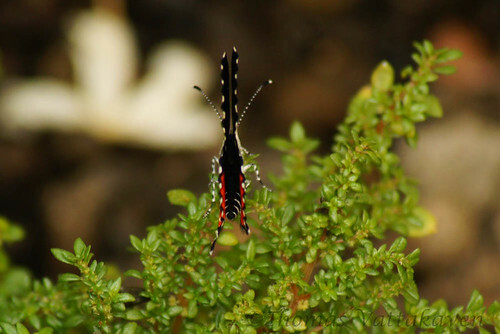 The Red Pierrot (Talicada nyseus) is one of the prettiest butterflies that I`ve seen. 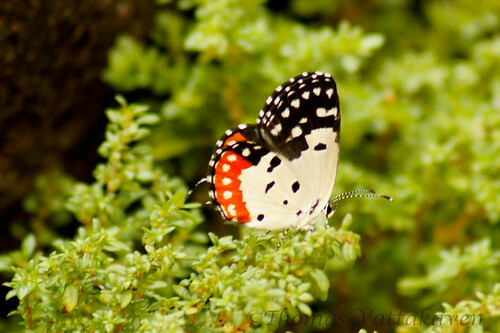 It is a small butterfly with a striking combination of red/orange, white and black colors. 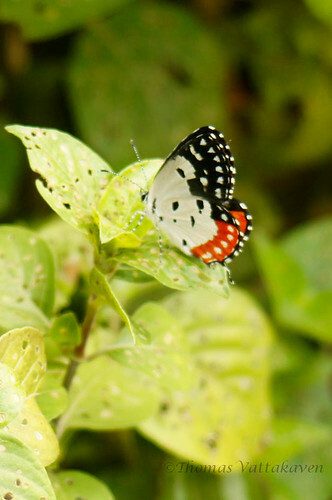 The upper parts of the wings are visible only when it flies or spreads its wings and is composed of an all-black upper wing and the lower wing having a large patch of orange. Both the wings are bordered by a alternating black and white dashes. This butterfly is a weak flier and flutters about close to the ground. Weak fearless flight is often indicative of the poisonous nature of the butterfly , but this one is not thought to be so. The Kalanchoe is the main host plant for this species and the plant is not known for producing toxins. The female lays its eggs on the succulent leaves of this plant and when the caterpillar hatch, they tunnel into the leaf and eat it from the inside! Its only when the larva change leaves or when they are ready to moult that they become visible. The larvae usually spins its cocoon on the undersides of the leaves of the same plant. Its a joy to have this species around and its slow flight, resplendent with flashy colours never fails to catch my eye. Great series of shots, Tom. Its a really pretty butterfly, really attractive colours. 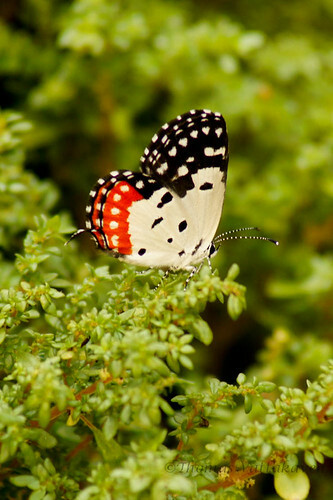 I used to see them in kerala long ago, but since then, even there are less species of butterflies.